I hate having greasy hair. If I didn’t know how bad it was for my hair I would shampoo it every single day. This week though, I’ve had to change my hair washing routine up a bit due to problems with the boiler. No hot water = not fun. To cut a long story short, I was told it would be fixed by Thursday evening so I lasted four whole days with icy showers and without any hair washing. Come Thursday night, I was told that they weren’t able to fix it just yet and it would take another day. Now don’t get me wrong, if it didn’t look bad I would have been fine with it but my hair was probably greasy enough to cook my breakfast on. There’s no way I could walk into the office like this, even if it was a Friday. Cue dramatic meltdown. On the verge of a rage, I remembered my last post and my attempt at being a happier person so instead I decided to opt for a quick fix and look for a dry shampoo that would get me through one more day. The next morning I walked into the salon nearest to my work place, slightly embarrassed at the state of the shiny, flat mop resting on my head. The lovely receptionist gave me a sympathetic look and literally said “SNM” (I had no idea people actually say this in real life?) as she pulled out a bottle of her finest. 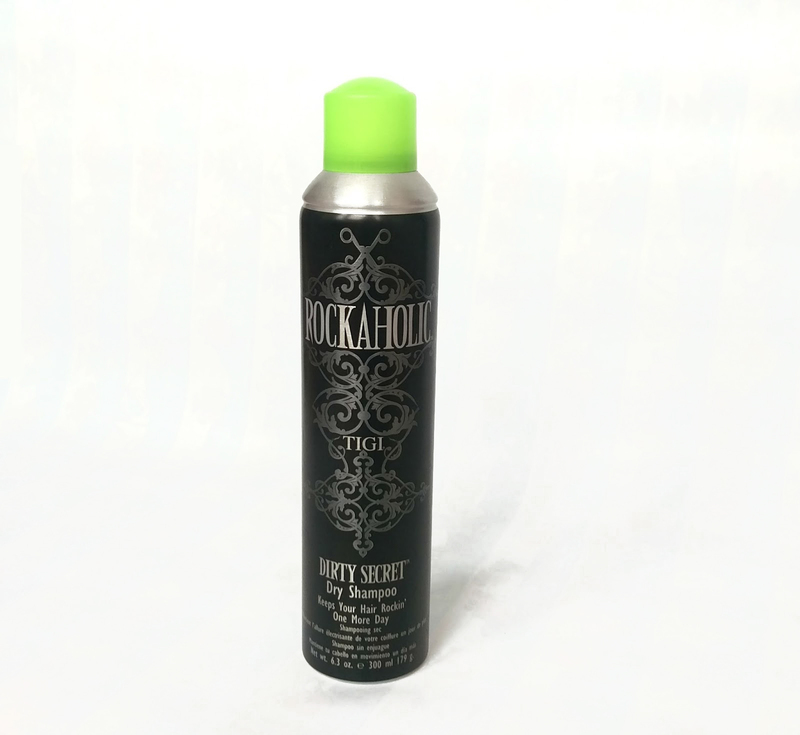 The dry shampoo she recommended is part of the Bed Head Rockaholic range, which comes in a matte black bottle with a green cap. Not gonna lie, I both loved the look of it and was a little afraid to try it at the same time. Unlike other dry shampoo’s you get your money’s worth as there is a generous 300ml in the bottle. I later found out that it is paraben free too which is even better, sadly I couldn’t find on the net anywhere whether it was free of sulphates. So how does it work? Dry shampoo is basically a starch or talc based substance which soaks up some of the oil at your roots. This product takes away excess shine at the scalp whilst leaving the rest of your hair looking great. 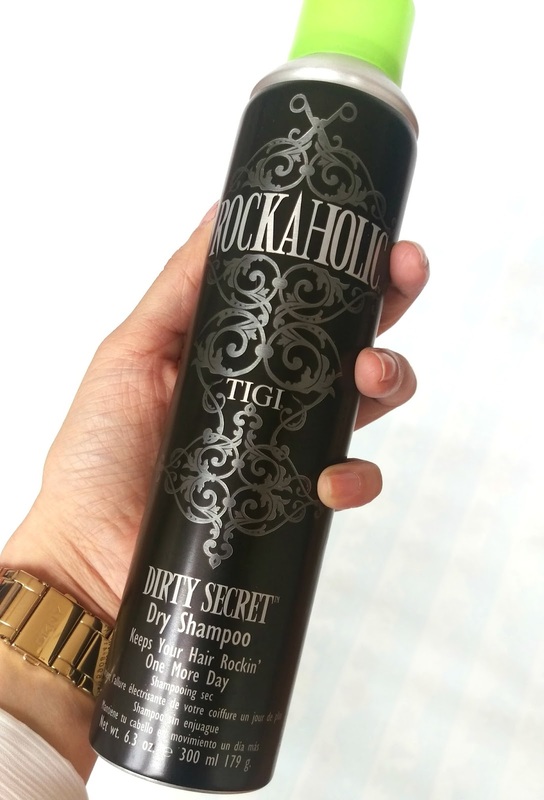 Other benefits of using a dry shampoo is that since shampooing everyday can strip your hair of its natural oils leaving your hair dry and brittle, using a dry shampoo means that you aren’t getting rid of these oils completely. Additionally, if you’re not blow drying and putting a straightener on to your hair that often then it also reduces the opportunity for damage to your lovely locks. If you colour your hair then think about it this way, less shampoos equal less opportunities for hair color to fade! Why on earth haven’t I been dry shampooing until now?! This sounds amazing. To use the product, hold the can as far away from your hair as possible; at least 10-12 inches. This is because the product has a powdery base, if it’s sprayed too close you can end up with white or chalky looking roots – not a good look! Spray anywhere that’s greasy and wait for about a minute for it to settle down and then brush it out. I love that Tigi’s Dirty Secret Dry shampoo is almost colourless, so less chance of forgetting you’ve got white powdery roots if you’re in a rush! Another tip I’ve picked up is that if you dry shampoo before you go to bed and brush it out in the morning, you get much better results. My only actual concern was how it would smell. I’ve smelt other dry shampoos and the smell has put me off trying them out, however with Dirty Secret Dry shampoo I was pleasantly surprised by the fresh citrus scent. It wasn’t over powering or strong but enough to smell kinda like I had washed my hair? weird I know. For me, this product has done exactly what I needed it to do and exactly what it says on the bottle – “keeps your hair rockin’ one more day”. I’m not sure I’ll be ditching my every other day washing of my hair completely, but since there are a lot of pros for using a dry shampoo, I’ll definitely be looking at using it when I can, epecially once I’ve dyed my hair again! What are your thoughts on dry shampoos? yay or nay?